The first real frost forecast came late last week. After some discussion, we decided that tucking table clothes around the tomato plants probably wouldn't provide enough protection, as it had the week before. So, Thursday night after dinner, my intrepid husband donned a headlamp and got out our biggest bowl. He came back in with his bowl full of little green tomatoes. Now, we have two full cookie sheets of tomatoes in various stages of green to red. Because I have discovered the wonderful world of tomato concassé. 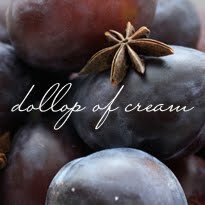 I don't think I'd ever had concassé before, except maybe in a fancy restaurant where I didn't know all the names for things that happily passed by my lips. 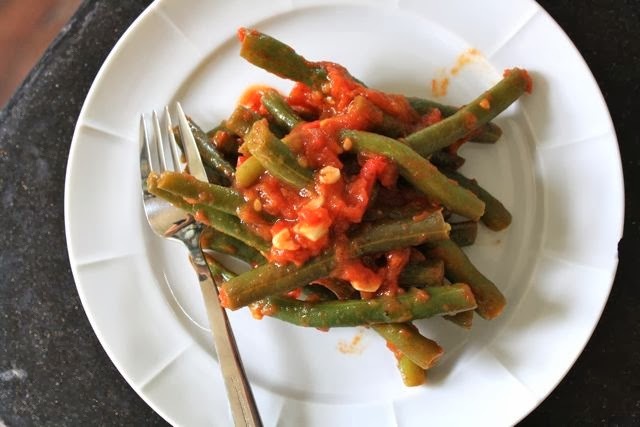 Laura Calder, of course, knows the names for French foods, and I found this recipe for green beans with garlicky tomato concassé as part of a menu called "An Unintimidating Dinner on a Reasonable Budget"* in Dinner Chez Moi. It turns out that a concassé is this plump, velvety mass of tomato sauce that tastes like it costs well beyond "reasonable." I think the secret might be the mere half a teaspoon of balsamic vinegar, which somehow brightens the tomatoes but doesn't make them at all acidic. 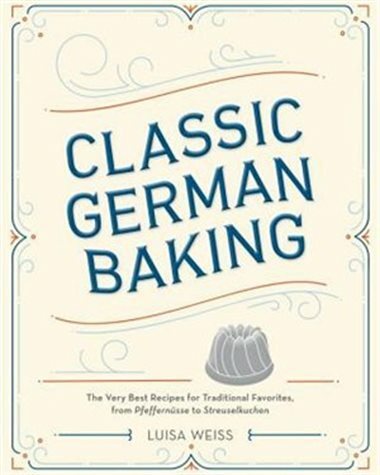 And that little teaspoon of sugar makes the tomatoes softer and more friendly, too. 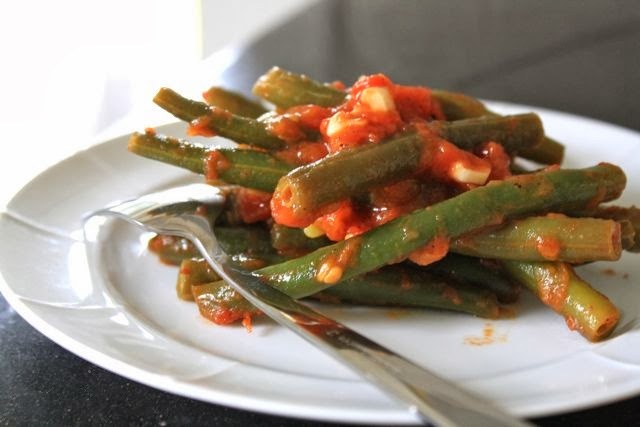 Concassé is a tomato sauce transformed, and it's lovely and smooth alongside crisp green beans. Just the thing for your trays of tomatoes. * If you're curious what else is on Laura's menu: avocado with citrus dressing, flat-roasted chicken with merguez sausages and a cake of cherries. First, set about peeling the tomatoes. Bring a pot of water to boil. Mark a small X on the tomato bottoms and drop them into the simmering water. Leave in for 10 seconds to 1 minute to loosen the skin. 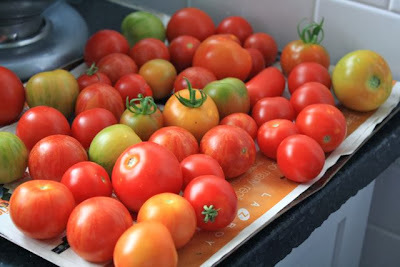 Use a slotted spoon to take the tomatoes out and set the tomato water aside. Place the tomatoes in ice-cold water so they stop cooking and you can work with them sooner. When they're cool enough, peel the tomatoes. Make thick slices and push out the seeds. Set the seeds aside to use for something else. * Chop the tomato flesh until it's a pulp. Put a large frying pan over medium heat and heat the oil. Cook the garlic gently for up to one minute; don't let it colour. Stir in the tomato pulp, sugar, balsamic vinegar and bay leaves. Add salt and pepper to taste. Cook until it becomes a thick sauce, about 20 minutes. Remove the bay leaves. Set the tomato water over the heat again and salt it. Once it's boiling, cook the green beans until al dente, about 5 minutes. Drain the beans and put them in an ice-water bath to stop further cooking. Drain again. Stir the beans into the tomato concassé and gently heat through. Serve. * I like to put the juicy tomato seeds in a small bowl, season it with salt and pepper, and eat it like a fancy appetizer.